The system can serve up to 48 landings in full collective-selective (UML-51F) via full serial communication with the shaft and with the car. After power-up, the controller recognizes the floor number and the location of the car via floor cards in each floor, thus avoiding the need for the elevator to find zero position at terminal floor. 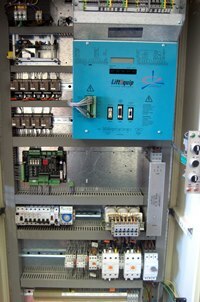 Integrated Group Communications up to 7 lifts in one Group. Analogue weighing input 4-20mA or 3 dry contacts for full load, overload and 50% load foe evacuation application to MRL lifts. Fully programmable through TST programmer. Leeav looks forward to provide you with any additional information you may require to adapt this state of the art technology in your upcoming projects.